Many of us deal with the image we present to clients and employers. For increasing numbers of men and women in today’s economy, that may mean starting over in the job market at an advanced age. For some people that may include using hair dye. Others like to colour their hair for a change or for fun. I am going to tell you how you can save money and more, if you do use hair dye or bleach. Almost all hair dyes that can cover grey hair and all that can lighten hair colour, contain hydrogen peroxide. A peroxide developer is used to activate hair bleach. When hydrogen peroxide is applied to hair it produces free radicals that are damaging. The result can be hair that is dry, or breaks easily, and grey coverage can be unsuccessful. The free radicals are generated primarily by the iron and copper, absorbed into hair from tap water and some hair care products. Chelants are chemicals that occur naturally or can be synthesized, that bind metals and can be used to keep iron and copper from reacting with peroxide. 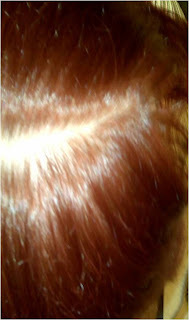 Proctor and Gamble (P&G) has found that their synthesized copper chelant can minimize hair damage more than 95% and better dye uptake is achieved with it. One of the ways to use it is in a pre-treatment. Chelants can be used that way naturally and hair can be conditioned too. Both coconut and argan oils contain chelants that chelate iron and copper. Argan oil chelates more copper than iron. You just need the pure oils. They can be used separately or in combination. At least 1 hour is recommended, to let the oils saturate the hair before dye or bleach is applied directly over them. The hair should be free of any residue and conditioner. Heavy oiling has been reported to give the best results. Update 3/4/13 - the linked information is why a heavy oiling works better. See "in a level higher" in the linked text, "". On a forum I (updated) belonged to, there have been over 51 no damage reports so far using these oils. Heavy oiling has been reported to yield the best dye uptake, lightening and conditioning results. These oils saturate and can penetrate well clarified hair and have not been reported to interfere with hair dye uptake or lightening in any way. They have been reported separately and in combination, to increase dye uptake, colour intensity and yield great lightening results, with no hair damage from the chemical processes used on top of the oils being reported, in the overwhelming majority of cases. Nothing can return hair to its pre-damaged state. These oils help prevent damage and can make buying products to deal with hair dye problems unnecessary. They can help save your cosmetic budget and help save your hair. 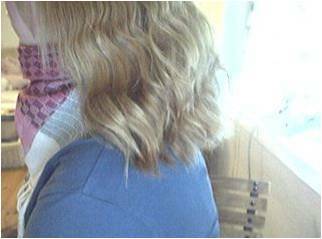 Results reported by forum member Dolly, after pre-treatment with a heavy coconut oiling: Great grey root coverage, soft shiny hair with no damage reported and intense colour that lasts, shown here after using permanent hair colour. 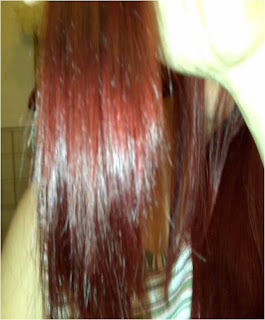 Far right: 1 week after hair colouring with her latest pre-treatment. Bianca's results: A heavy coconut oil pre-treatment before using bleach to lighten henna and then another heavy coconut oil pre-treatment before applying hair dye to adjust the colour. No hair damage was reported after the double processing.